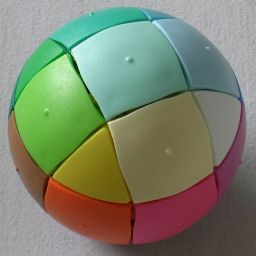 Bolaris is a spherical sliding piece puzzle from Finland. 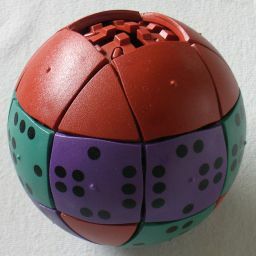 It is similar to the Equator, in that it has square tiles sliding on three tracks on a sphere, and the Massage Ball in that it has a gap into which the pieces can slide. The puzzle has three intersecting rings of 8 tiles, and there are 6 intersection points, leading to 18 tile locations filled with 17 square tiles. The puzzle exists in various colours and designs. 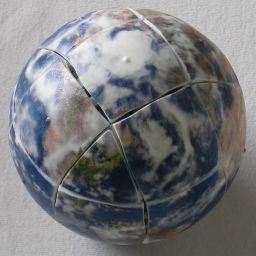 The most difficult has a picture of the globe on it so that all the pieces are unique and their orientations are visible. The easiest has just four colours of tiles which have no prescribed orientation. This puzzle was invented by Hannu Hjerppe, and has the patent WO2009/068726, published on 4 June 2009. There are 17 tiles and a blank space, and each tile has 4 possible orientations, giving a maximum of 18!·417 positions. This limit is not quite reached because the permutation parity is odd or even depending entirely on the position of the blank space. This leaves 18!·417/2 = 54,995,971,365,744,175,742,976,000 or 5.5·1025 positions for the globe design. The table below gives an overview of all the designs and their number of positions. Note that in its solved state the Harmaa (greyscale) design has four-fold symmetry. This means that the number of really distinct positions is only about a quarter of the number given above. To get the exact number of positions we need Burnside's Lemma, which gives the number of positions as ( 18!/(1!4!8!4!1!) + 2·2!4!/(1!2!1!) + 2!8!/(2!4!2!) )/4 = 68,919,072. The domino design needs some explanation. It has 13 tiles with dots on them like dominos. The dots mark the edges of those tiles with the numbers 1 to 4. There are six identical purple tiles, with markings 1, 3, 2, 4 clockwise around the border. Seven identical green tiles have markings 1, 2, 4, 3 in that order. The remaining four tiles are brown and have no markings. The aim of the puzzle is to arrange the tiles such that the dotted tiles fill the equator and the Northern hemisphere above it, and also that tiles that are adjacent have matching numbers on their touching edges. The Southern hemisphere contains the brown tiles with the blank space at the South pole. This shows that any position can be solved in at most 28 moves, or 56 single tile moves. That single antipode that needs 28 moves is the position where the four light grey tiles are swapped with the four dark grey ones. Bolaris, the website of the manufacturer. The tracks in which the tiles slide can be thought of as eight triangles. Slide the blank space around a triangle 5 times. The 5 tiles will all have gone around the triangle once, in the oppostie direction to the blank space, returning to their starting locations. They have all been twisted by one quarter turn. In this way you can twist any piece as long as it lies in (or can be brought into) a triangle that has not yet been solved. When solving the puzzle, it is easiest to start from the opposite side of the puzzle to where the blank space belongs at the end. On the Globe design the space ends up on the South Pole, so it is best to start solving the Northern hemisphere first. The greyscale design has the space functioning as the black tile at the end, so you should start with the white and light grey tiles. On the rainbow design, start with the pale green tile. Phase 1: Solve everything above the equator. Hold the puzzle such that the bottom intersection will be where the blank space ends up once it is solved. Find the tile that belongs at the top intersection. Solve this tile. Just bring it into position, and if it is incorrectly oriented, twist it by moving the tile around one of the triangles until it is correct. Find a tile that belongs in a location adjacent to the top intersection, but which lies on or below the equator. If you cannot find any such tiles, then you can use the move sequence in step f to replace any incorrect tile adjacent to the North pole. The displaced tile now fits the criteria. Hold the puzzle so that the location this tile belongs is at the front. Bring the tile the front intersection, just below where it belongs. Orient the tile correctly if necessary. You can twist the tile by moving it around one of the bottom triangles. 1. The starting situation has the tile you wish to insert at the front intersection, above it lies the location you will insert it into, and the blank space is the right of the tile. 2. Shift all the pieces around the top right triangle in an anti-clockwise direction. This moves the incorrect tile downwards. 3. Move the pieces around the bottom right triangle in an anti-clockwise direction. This replaces the incorrect tile with the correct one. 4. Move the pieces around the top right triangle clockwise. This puts everything back into position. Repeat steps c-f until everything above the equator is solved. Suppose the blank space lies at one of the three locations between the front left and front right triangles of the top half of the puzzle. We can move the pieces around either of these triangles in either direction. Let L denote the clockwise movement of the 5 pieces around the front top left triangle (the space moves anti-clockwise) until the space is back where it started. Let L' denote the anti-clockwise movement of those pieces. Similarly I'll use R and R' to denote the clockwise/anti-clockwise shift of the pieces around the top right triangle. Phase 2: Solve everything except the tiles around one triangle. Turn the puzzle upside down, so that everything below the equator is solved. Turn the whole puzzle to the left, so that the previously solved tile lies at the left intersection. Find the tile that belongs to the left of the front intersection. If the tile happens to lie to the left of the top intersection, you can extract it by doing L R' L'. Bring the tile to the front intersection, with the blank space above it If necessary, orient it in the same way as before in step c.
Put the tile into place by doing L' R' L. This moves the tile from the front intersection to the location to its left without disturbing any other tiles on the left. Find the tile that belongs to the left of the top intersection, and bring it to the top intersection, with the blank space in front of it. If necessary, orient it in the same way as before in step c.
Put the tile into place by doing L R L'. This moves the tile from the top intersection to the location to its left without disturbing any other tiles on the left. Repeat steps c-h once more. Now only the tiles in the R triangle remain to be solved. Phase 3: Position the 5 remaining tiles. Do R or R' to cycle the 5 unsolved tiles around until as many of them as possible are in their correct locations. If the tiles are not yet correctly positioned, then examine them to determine which pair of them needs to be swapped in order to improve the situation. 1. Do R or R' until the two tiles you want to swap are at the top intersection and the location directly to the right of the top intersection. 2. Do LL R L'L' R'R' L.
3. Undo the move of step 1 by doing R or R' until as many of the tiles as possible are correctly positioned. Note that this will also swap two tiles that lie in the L triangle on the equator. On the Harmaa version of the puzzle this will not be visible. On other versions you can just ignore this, as they should automatically be swapped back once the R face tiles are positioned correctly. 1. Do R or R' until the two tiles you want to swap are at the front intersection and the location directly to the right of the top intersection. 2. Do L' R' L' R L L.
Repeat steps a-d until all the pieces are in their correct locations. 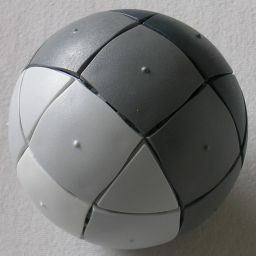 This phase is only needed on the Maailma/globe design where the orientations of the tiles is visible. Examine the orientation of the tiles, and calculate the total twist of the tiles. A tile that is twisted clockwise counts as 1, a tile that is twisted 180 degrees counts as 2, and a tile that is twisted anti-clockwise counts as 3. We want the total twist, the twist of all the tiles added together, to be a multiple of 4. If it is one less than a multiple of 4 (i.e. 3, 7, 11, 15) then do R5 to fix it. If it is one more than a multiple of 4 (i.e. 1, 5, 9, 13) then do R' 5. Finally if it is even but not a multiple of 4 (i.e. 2, 6, 10, 14) then do R10. Check that the total twist now really is a multiple of 4 before you proceed to the next step. Find a tile in the R triangle that needs to be twisted, and remember by how much it should be twisted. Do R moves until the twisted tile lies at the front intersection. 1. To twist by an anti-clockwise quarter turn: Do L R5 L'. 2. To twist by a half turn: Do L R10 L'. 3. To twist by a clockwise quarter turn: Do L R'5 L'. Note that what this actually does is turn all the other pieces in the R triangle in the opposite direction, so that relatively speaking they match the orientation of the current tile. Do R moves until the tiles are in the correct positions again. If you wish, continue until they mostly have the same orientation as they had after step a.
Repeat steps b-e for each of the twisted tiles in the R triangle. Note that the above steps will also have twisted the tile to the left of the top intersection. If you did step a correctly, this tile will automatically be correct again once all the R tiles have been oriented correctly.